The Post won two awards for front page design in the San Francisco Press Club's Greater Bay Area Journalism Contest. The Daily Post’s newsroom received 15 awards in the San Francisco Press Club’s Greater Bay Area Journalism Awards competition, including honors for investigative reporting, entertainment reviews, columns, headline writing and design. The Post competed with the other daily newspapers in the Bay Area including the Chronicle and Mercury News for work in 2017. The 41st annual awards were presented at a banquet in Burlingame on Thursday night. 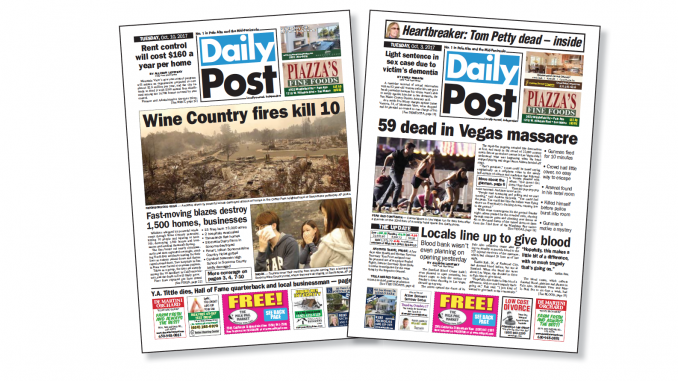 The contest was judged by media professionals at press clubs in other parts of the U.S.
• Front Page Design, “Wine Country Fires,” Dave Price, first place. The entry is displayed above, on the left. 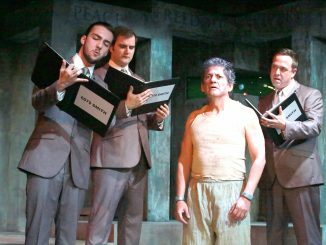 • Headline, “Feathers fly over Cuckoo’s Nest,” Dave Price, first place. • Feature columns, Dave Price, second place. • News/political columns, Dave Price, second place. • Entertainment Review, Jamie Morrow, reviews of HBO’s “Silicon Valley,” second place. 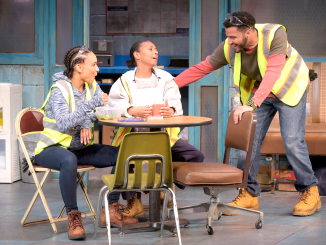 • Entertainment Review, John Angell Grant, third place, “‘Airport Insecurity,’ a timely comedy, third place. • Feature Story of a Light Nature, Jen Nowell, “After 87 years, toy store to close,” third place. • Front Page Design, “Vegas massacre,” Dave Price, third place. The entry is displayed above, on the right. • Headline, “Bill O’Reilly enters the no-job zone,” Dave Price, second place. • Headline, “Green light for Greenheart,” Dave Price, third place. • Investigative Reporting, “Assistant principal’s notes about her boss are revealed,” Jen Nowell, second place. • News Story, “Light shed on college district’s $140 million loss,” Emily Mibach, second place. • Profile, “Legendary Channel 7 anchor Van Amburg dies,” Dave Price, second place. • Series, “An in-depth look at car burglary trends,” Emily Mibach and Jen Nowell, second place. Great showing for the local paper! Way to go! Congratulations to the Post! You’re my favorite paper. I can’t wait to get a copy every morning.